Kramer couldn’t resist testing a notebook that claimed to offer ‘cinematic-quality surround sound’, and real bass. Read on for his probing analysis. AT WITCHDOCTOR, WE’VE pretty much steered clear of reviewing run-of-the-mill gadgets, cameras and computers. Basically, if there isn’t a clear point of difference to a unit, then it’s better for us to apportion our resources to more interesting products. So when the PR agency representing ASUS got in touch with a long list of potential review products, we turned down most of them. However, there was a product range that really stood out – the N Series multimedia notebooks, which are marketed as having a ‘Quad-Speaker Array’. They’re designed to ‘offer cinematic-quality surround sound to enhance immersion in movies, games and other content’. That’s a bold claim but we approve of any company trying to improve audio quality, so we decided to get an N Series unit in to see if the sound quality was actually any better than the average notebook computer, or even the average multimedia notebook. We were sent a 17-inch N750 unit to play with. This is a good looking notebook, although there’s more than a hint of MacBook Pro styling DNA. Theoretically, any notebook using aluminium for the body is going to fall into that category, so it’s really not a big deal. Sizewize, like most 17-inch notebooks, the N750 is a bit of a beast (415 x 275 x 29.9mm and 3.3kg) but thankfully, even with those dimensions, it’s not all that thick or heavy compared to some models I’ve enountered. From a specification perspective, the N750 is well endowed without being spectacular, featuring fourth generation Intel Core processors and NVIDIA GeForce GT 750M graphics. The drive is a 5400 rpm 1TB model, but I’d prefer to see flash drives being implemented. With Windows 8 as the operating system, performance was good all round but frankly, we weren’t going to get into benchmarking, or attempting to eke out the last iota of performance or any other ultra-geeky things. We just wanted to see if a notebook could genuinely sound good enough to make a desktop speaker set superfluous, so music was where we got started, and music is where we stayed. The N750 has an interesting label on the top surface – the sound system is powered by a Bang & Olufsen ICEpower (Class D) amplifier, offering 19 watts over five channels, which shows that ASUS is taking sound seriously. In addition to the digital amp, the N750 has an external SonicMaster ‘subwoofer’ – a small, round, black plastic cylinder that plugs into a dedicated port on the side of the notebook. Calling it a sub is more than a little optimistic, but as the ASUS site points out, it ‘generates one octave deeper bass at higher volumes than the low note performance offered by other laptops’, so at least it’s contributing in a useful way. When the sub is in use, the bass frequencies are routed to it, while mids and highs are run through the N750’s speakers. 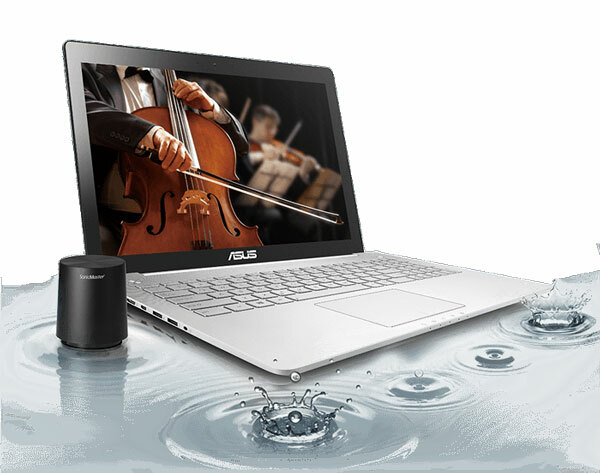 The Asus also benefits from having MaxxAudio Master professional audio tuning software installed, which gives users a fair amount of control over the sound of their notebook. This software offers ‘…four-way dynamic control, 10-band EQ with multiple filters, psycho-acoustic low frequency extension, and multi-dimensional spatial enhancement’ – basically, it’s a fancier version of the sound tuning programs found on computers for ages but in this instance, it does seem to work. So after all that, how does the N750 sound? Actually, not bad at all. I started off with a Pandora ONE stream directly from a web browser. With the sub in play and the volume pushed up quite high, the N750 was substantially clearer and better to listen to than my MacBook Pro. With a CD in the Mac’s drive, the sound was better again. In fact, I spent most of the day wrangling with a pile of CDs and the ASUS doing duty as the only source of music in the room. It did a good job, sustaining high volume levels, offering a very reasonable dose of midrange and treble clarity, and putting more bass into the room than you’d expect from a computer. Even without the ‘sub’, the four speakers are more capable than the tinny little things usually packed into a notebook. But back to the big question: could the N750 replace a set of desktop speakers? The answer is no. The sound quality is better than your average notebook but it can’t match a semi-decent set of desktop speakers, let alone a good pair. As a portable media consumption platform, the N750 does the job – watching a movie close up is exactly the immersive experience that ASUS promises, although if you’re one of those who tend to watch movies in bed, the ‘sub’ can be a bit ergonomically awkward. A set of good headphones will of course beat the N750’s audio to death, so that’s worth bearing in mind. NOTE: Pricing begins at NZ$2149 for the 15-inch model, and $1999 for the 17-inch model.